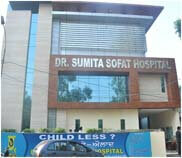 Sofat IVF is the name of success, trust, reliability and best quality. We strives to deliver happiness all around the world by making the dream come true of childless couples. Sofat is the world’s leading center for IVF where we ensure transparent practice with international standards and ethics. We are the IVF treatment center with maximum number of successful cases of IVF and infertility treatment. If you are seeking for best infertility treatment in Ferozpur then Sofat is the complete solution as we deliver value to words by achieving success and patient’s utmost satisfaction. Our IVF expert Dr. Sumita Sofat put her extravagant efforts to give personalized treatment to the couple and examine the infertility issue in detail. After complete evaluation as per the feasibility ratio of the IVF results she recommends treatment to couple. In the next visit IVF procedure is initiated with ovulation induction with the help of infertility drugs and injection. Then female eggs are retrieved on the basis of best quality of eggs. On the same day male partner’s sperms are taken. Then in the next step eggs and sperms are kept under the controlled conditions of Em-Cell closed chamber for fertilization and when fertilized eggs transform into embryos then healthiest embryo is transplanted in the womb of intended mother and rest embryo are preserved for future use of couple it is the end of IVF procedure for successful pregnancy. Our highest IVF success rates make us the best IVF center in Ferozepur.